Many financial decisions are made in situations of uncertainty, and so risk is involved. Different people are comfortable with different levels of risk. Your risk tolerance is largely a function of personality rather than age. We offer the FinaMetrica personal financial profiling system. Do you want to know your financial self better? Do you and your partner want to better understand each other's risk tolerance? Do you want to make sure your financial adviser is in tune with your risk comfort zone? Until now, unless you were fortunate enough to be with a select group of leading financial advisers who use the FinaMetrica system, you haven't had the chance to properly evaluate your financial risk tolerance. But now you do! To start your risk assessment or get assistance, please email george@gwrfinancial.com or call George at 425-677-8750. This is a web-based risk tolerance questionnaire followed by an optional demographic questionnaire. It does not directly provide investment or financial advice; instead, you can use this to help choose your investing strategy. FinaMetrica provides the Risk Profiling System to individuals wishing to have an assessment made of their financial risk tolerance. 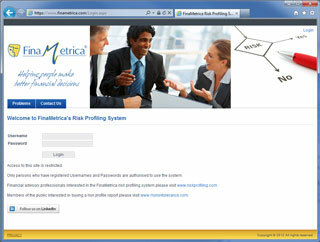 FinaMetrica statistically compares your risk tolerance answers with the answers of other people. The questionnaire takes about 15 minutes to complete. FinaMetrica is a safe and secure system; all communications and storage is encrypted. None of your information will ever be released or shared with others. We will always use every reasonable effort to safeguard your personal data. Call George and get started today.